If you asked Linda MacNish “How did Mac-Haydn get started?”, she would smile and say “Well, it was either start a theatre or drive to Alaska.” After some thought about it, she and co-founder Lynne Haydn opted to try putting on musicals in Chatham, just for one summer. 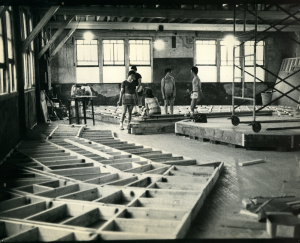 That was in 1969, when The Mac-Haydn Theatre was started on a shoestring, in a cow barn, and went on to prove that the area could and would support good theatre. Lynne was an aspiring actress and Linda was writing and producing off-Broadway shows and managing talent when the two met in New York City. A mutual love of musical theatre led to the classic “Let’s find a barn and put on a show!” Linda’s local roots led them to Chatham; at that time the closest professional theatre to this area was Broadway. A search for performance space led to the Chatham Fair Grounds. 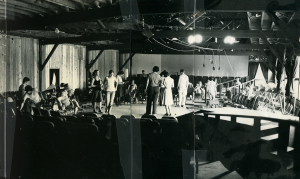 Some floor scraping, dressing room painting, auditioning and many rehearsals later, The Mac-Haydn Theatre’s premiere opening night brought the stage lights up on “My Fair Lady” on July 6, 1969. At the end of that first season, enough people asked “Are you going to do this again next year” that they decided to try it again. And again and again. We just had our 50th Anniversary season. They quickly outgrew the rented cow barn, and moved everything including seats (folding chairs borrowed from area churches and funeral homes), costume and prop pieces, pianos and even the stage at the start and end of each season. 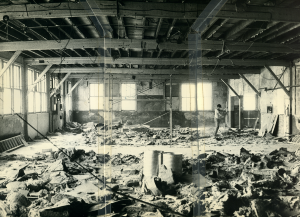 Having their own space meant a huge remodeling project to create dressing rooms, costume and set shops, rehearsal room, box office and offices in a space that had most recently been a doll furniture factory. Wonderful donations of the former Chatham Post Office façade, and theatre seats from Tony Quirino at the Crandell Theatre, along with a host of hard-working volunteers, and even some of the performers, it all came together for the opening of “Fiddler On The Roof” in June of 1978. That first season there were about a dozen New York City performers, a few technicians, musicians, a director, combined with a lot of area volunteers both on and off stage. Today there are almost 100 people on payroll throughout the summer in all departments. There has always been enormous talent on stage; Joe Lane played several feature roles and went on from Chatham to become Tony-Award winner Nathan Lane. He is just one of the many Mac-Haydn alumni who have had and are having successful careers ‘in the business.’ Currently the Mac-Haydn is represented in several Broadway Shows, National and International Tours, Regional Theatres across the country, and some have even ventured into Film and Television. This fulfills the second purpose Mac-Haydn was founded on: to provide a high-quality professional place where young theatre hopefuls can expand their experience and talents to become the ‘stars of tomorrow’. Sadly, Linda MacNish passed away in 2002. At that time, people asked if the theatre would continue without her. Lynne answered “It would not be right to her memory to do anything else”. Hundreds of performers and creative staffers and thousands of audience members have been through Mac-Haydn’s doors since the first show in 1969. We are looking forward to seeing many more in the years ahead. When did the theatre start? Lynne Haydn, who passed away in 2018, and Linda MacNish, who passed away in 2002. Why do you only do musicals? The theatre was founded in part to preserve musical theatre as the one individually American theatre form. Has there ever been a straight play? Two: Mary, Mary in our first year, and Visit To A Small Planet in 1979. Have any famous people ever performed here? We like to say that ‘The stars of tomorrow are at Mac-Haydn Theatre today’. Quite a few of our performers have gone on to be ‘famous’. Nathan Lane performed here in 1976; some others include TV and movie star Paige Turco, Metropolitan Opera star Frank Lopardo, TV and MathNet star Joe Howard, and a host of others who are now working on and off stage in regional theatres, international tours and on Broadway. The main part of it was built around 1906 as a printing company. It has also been a silent movie studio (Norma Shearer made movies here), a town meeting hall, a roller skating rink and a doll furniture factory. Where do the performers come from? All over the country and the world. We audition in New York City and in Chatham, and pick the people we like best from over 1,000 seen each year to come to perform for you. We also have always used people from the area, there are many talented people here and some have gone from Chatham to careers in theatre. Who decides what shows you do? The audience helps a lot, by picking their favorites on surveys given out each summer. The Artistic Director also looks for shows we have not presented before, and then contact the royalty houses to see which ones we can obtain the rights to produce. Why don’t you do shows during the winter? There’s no heat in the building!